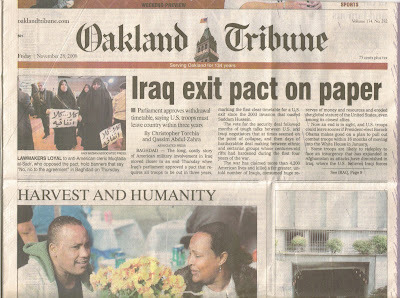 We went to an awesome free Thanksgiving Dinner on Thursday and ended up on the cover of Oakland Tribune the next day. If it wasn't for this article I would have never found out about this generous man from Yemen who put on this free dinner for 6 years in a row now. As it turns out it was the owner of the store next door who put on the dinner. Not once did he announce who he was, there was not a single branding item, no advertisement, nothing, just pure love, just pure generosity straight from the heart. Amazing! OAKLAND — Gypsy Taub, David Depape and their three small children could have cooked and eaten a traditional Thanksgiving meal in the comfort of their Berkeley home and been happy enough. Instead, the young family chose to join 350 others at the Two Star Market for a community meal. "No matter how much money we have, I still want to come to community dinners," Taub said. "I want to be in touch with real life. Financial independence is a great thing, especially if you have kids, but I don't want to lose touch with humanity." For a sixth year, Abdo Alawdi, 34-year-old owner of the Two Star Market and liquor store in the Dimond district, has put on a community feast for anyone who wants a free, hot Thanksgiving meal. Volunteers, the Dimond Improvement Association, friends and family help out with the preparations and cost, which runs about $6,000, he said. It was the first time Taub and Depape came to the feast, but they wasted no time eating, dancing, socializing and showing good cheer to strangers. "We like to meet our neighbors. I want my children to learn that everyone is a human being and a friend," said Taub, who said she makes videos for public access television. "I also want my kids to learn about sharing. In Russia, where I am from, people share more, and I want my kids to grow up knowing sharing." 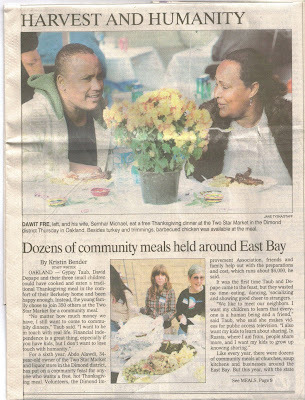 Like every year, there were dozens of community meals at churches, soup kitchens and businesses around the East Bay. But this year, with the state unemployment rate at more than 8 percent, the federal bailout $7 trillion, and foreclosures up 70 percent from this time last year, according to federal statistics, more people were looking for a free meal Thursday. Brian Higgins, spokesman for the Alameda County Community Food Bank, said calls to the agency's emergency food line are up 39 percent in past year and 59 percent compared with two years ago. First-time callers to the help line are up 22 percent, he said. "A lot of people are out of jobs, and a lot of people are looking for something to eat," said Mickey Ganitch, 89, of San Leandro, as he helped usher people to their tables at Lake Merritt United Methodist Church in Oakland. The church has been putting on a free Thanksgiving meal for 29 years and was packed an hour before serving time Thursday. "There's a lot of people I haven't see before," said Ganitch, who has been the head usher at the church for 44 years. The church usually plans for 500 meals. This year, they planned for 600, said Stephen Ford, Thanksgiving meal coordinator. The church also has been running low on food Tuesdays and Sundays when church workers give away free bags of groceries, said volunteer Russ Aubry, of Berkeley. "We've had to turn people away because we ran out of food," he said. Two Star's Alawdi didn't run out of food Thursday. He had 25 turkeys, 500 pounds of chicken, 50 large trays of stuffing and other side dishes, and 35 pies. He bought much of the food on his own, but people also stopped by with goods to donate, volunteer Robert Raburn said. "I had someone drive up and give us a case of wine. I've had people drive up and say, 'This is my mom's favorite recipe,' before handing over a tray of vegetables," he said. He also had nearly 100 volunteers come from as far away as San Jose and Brentwood to work the food line, decorate, grill chicken and clean up. "We put this out on Craigslist.org. We're never going to do that again," Raburn said, smiling. "We've really seen a lot of generosity." Annie Rockwell, of Oakland, hadn't volunteered at the Two Star before Thursday, but with President-elect Barack Obama — a man who wants to rekindle the spirit of volunteerism — about to take office, she hopes others will follow her lead and help out. "Hopefully we will have a society that will organize to meet the needs (of others), but until then it's better to do what you can," she said. Alawdi, who has run the store since the early 1990s, learned his charitable ways from his late grandfather, Mohamed, who back home in Yemen cooked for relatives and the community at the end of Ramadan and to mark the pilgrimage to Mecca, he said. Alawdi said Thursday that the meal ran smoothly and the scene was about the same as last year, except for one change: "We need more food for the people."